An e-mail has been sent and he/she has 48 hours to respond. How many times have you wished you had written down a great idea, kept track of memories or just had a place to store your personal effects? I'm always grabbing a pad of paper here, a sheet from the printer or whatever is currently available to jot down random thoughts, to-do lists or whatever. I can be the most unorganized person at times due to not organizing my thoughts. I was happy to be able to work with Personal Ponderings for this great giveaway. Personal Ponderings, as their easy to guide website depicts, are innovative journals that enable you to organize your thoughts, feelings, ideas, notes and experiences. There really is no barrier for what you can utilize these great journals for. The Personal Journal is an all-new unique journaling system designed to enhance and simplify your journaling experience. Don’t have time every day to write? Use the one-line entry page. Want to access your memories quicker? Organize them by year. Want to keep track of specific special events? Use the tabs in the back. The journal is 8" x 10" and contains 50 sheets, the PJ Organized Journal System, 8 blank tabs and travel companion with 50 lined gummed sheets. I really like the idea of not being restricted to record my thoughts based on the book's design. This is a great feature to allow you to customize it to your own style. The travel companion is equally impressive especially for those on the go. This smaller version allows you to keep your random thoughts organized without having to worry about losing pages or forgetting that great idea or what you had to pick up for tomorrow's school snack. The Scripture Journal is a Spiritual Journal and study tool. With the Scripture Journal you can record personal spiritual writings and notes, create your own spiritual quote book, become intimately acquainted with truths, gain a deeper understanding of Holy books, and come to know both God and yourself. The Scripture Journal is equipped with A to Z tabs so you can journal, organize notes, record personal insights, thoughts, and spiritual impressions by topic as you read and study scriptures and other deeply meaningful material; For example – Love, Faith, Hope, or Grace could all be study topics that you keep in your Journal. A benefit of using the Scripture Journal is it allows you to add to your topics over time, keeping everything organized and easily retrievable. I have a friend who is really nudging me to devote more time to studying scripture and increase my spirtual knowledge. This would be the perfect addition to allow an easier way to keep all my thoughts and scriptures in one place to ponder what I'm thinking or learning as well as to go back and refresh my memory. This would make a great gift as would any of the other two journals. The Literary Journal - Finally! A tool that provides a safe place for powerful and personal thoughts. The Literary Journal is a depository for personal philosophy that remembers for you the impressive things you read. As a reading, writing, pondering, and study tool, the Literary Journal allows you to alphabetically organize notes from books, lectures, etc. Create your own list of quotable quotes and organize them by topic. Have you ever wanted to refer to or recall something you read once, but just can’t quite remember it correctly, or find which book it was in? The Literary Journal is an easy to use organizer that will solve that problem, and also become a best friend. Imagine having all the principles and insights from your favorite authors in one place: wisdom and understanding will deepen! This would be optimal for the book I've been trying to write or my daughter in college. She's like me and has numerous pads of paper where she is always jotting down notes and information and none of it is secure. With a journal such as this, she would be able to maintain some organization. Personal Ponderings also has all the available refills you need at low prices. Even the journals priced at $24.05 is a great price. As a small business with a woman president and co-founder, I'm very happy to provide this information to my readers. Personal Ponderings seems to be a company that understands first hand the importance of organization and capturing those thoughts, notes, information and more. Your choice of the Personal Journal, the Scripture Journal or the Literary Journal. 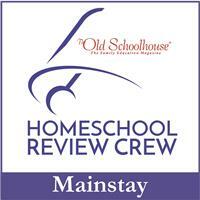 Follow my blog and go to Personal Ponderings and tell me something you learned about the company or the products. Follow Personal Ponderings on Twitter. Join Personal Ponderings on Facebook. Giveaway ends 2/2/10 at midnight. Winner will be chosen by random.org. I liked how, on their web site, you were able to view the interior of the product. I looked at the Scripture Journal, and saw that, in addition to the alphabetical tabs, it had sections for blessings and so forth. And refills are reasonably priced. Thank you so much for this giveaway! I learned that the three-ring binder style allows you to take and add pages to the journal. I love that they have a Travel companion version to enable you to take notes, write thoughts, and record experiences on the road and then file them in your journal when you get home. i follow the blog and I found out that the literary journal has 50 sheets. nice! I follow and I would select the Spiritual one for my husband. I learned that they officially became a company in Sept 05. 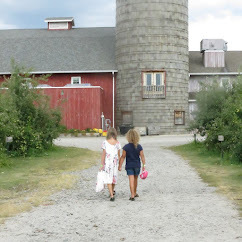 I follow your blog and learned they became a comany in Sept 2005. THey also have travel compannions which are cool. I like the literary notebook. Personal Ponderings has developed three journals that represent the most often-cited types of journals people keep. They even have a Travel Companion journal for when you're on the move! I love this company, and really any company that gives serious journallers serious tools. I subscribe to HB&F RSS via Google Reader. I am a follower on Twitter as hybroanglid. I follow PersonalPonderings on Twitter as hybroanglid. I joined Personal Ponderings on Facebook. 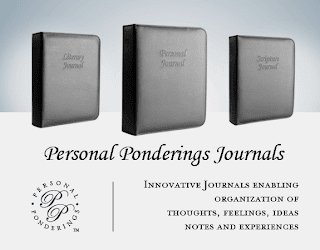 I learned that Personal Ponderings offers 4 types of journals: personal, travel, scripture, and literary journals. And Personal Ponderings' mission is to contribute to the “great conversation” which they view as the meaning and purpose of life. I love these journals. This company was established in 2005 by Michelle Roberts. I learned that Personal Ponderings offers 4 types of journals: personal, travel, scripture, and literary journals. Thanks for the chance! I love the idea of a Scripture Journal. A place to write personal issues and bible verses, a place to write prayer needs and answers to prayers. I couldn't find a picture of the interior of it but the exterior is lovely. I joined your facebook page! I learned that they have a Scripture Journal that looks just like the ponderings journal, but is geared towards spiritual thoughts. A great gift for my mother-in-law! following your blog as klp1965By dividing life into three areas: day-to-day living, literary works, and spiritual experiences, we can more easily organize our own record, the great ideas of others, and our personal revelations. I learned that Casey the designer started off working with her parents at their wedding invite business!! Too funny! Each of the journals comes with blank tabs. They provide the journaler with the ability to create sections or topics, which allow for true personalization.